Osteochondroma is the most common benign bony tumors, often described as a cartilage capped bony projection on the external surface of the bone. They comprise approximately 35-50% of all benign tumors and 10-15% of all tumors  . It is commonly encountered in the first two decades of life and has a male preponderance with males to female ratio at 3:1. Osteochondromas often present as a painless and slow-growing mass, however symptomatology may vary owing to location of these masses and also as resultant complications, including but not limited to fracture, bony deformity, joint mechanics, and vascular or neurological affliction  . The lesions can be solitary or multiple; sessile or pedunculated with the most common location of the solitary lesions being the metaphysics of the long bones, especially around the knee joint. With very few cases reported in the literature, herein is presented a case of solitary exostosis in the diaphyseal region of the femur in a young Indian boy. A 14-year-old boy presented with a swelling over the anterior aspect of the right mid-thigh that grew progressively in size ever since he first noticed it 1 year ago. It was associated with mild dull aching pain over the middle and lower part of the thigh, especially during playful activities. On examination, the swelling was approximately 6 cm× 4 cm × 3 cm in size, hard in consistency, immobile and nodular. Movements of the hip and knee joint on the ipsilateral side were normal with distal neurovascular status intact. There was no similar palpable swelling found elsewhere in the extremities. A lateral roentengeogram of the right thigh showed a sessile outgrowth originating from the anterior aspect of the femur, with a broad base and continuous with the cortex of the underlying bone [Figure 1]. Subsequently, magnetic resonance imaging (MRI) confirmed the continuity of the lesion with the cortex and medullary canal of the underlying bone. Water-rich cartilage cap visualized as bright structures owing to high-intensity signals on T-2 weighted images aided in differentiation from the underlying bone [Figure 2]. At this point of time, vigilant observation for any worsening symptoms and regular follow-up was advised. Subsequent to 3 rd month followup, patient developed persistent mild soreness around the swelling during and after playful activities. Attributing the origin of the dull aching pain to the pressure effect of the lesion compressing the surrounding structures, a surgical excision under spinal anesthesia was planned. Intra-operatively, the perichondrium and marginal periosteum were excised to minimize chances of recurrence. 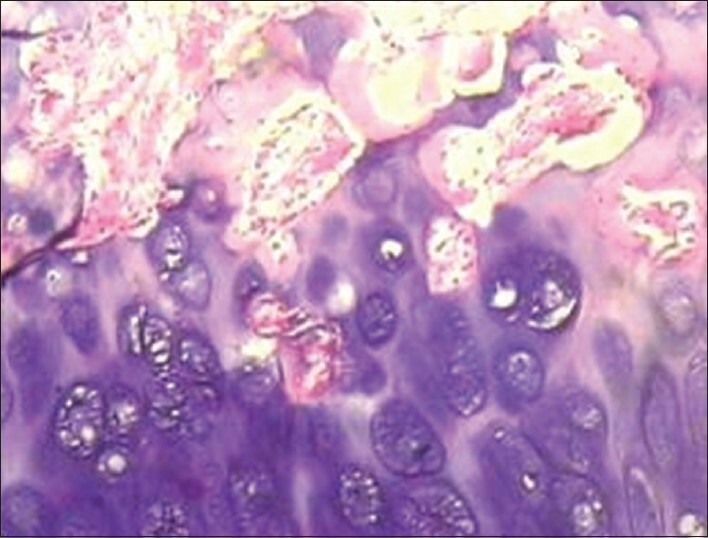 Histopathological section demonstrated cartilaginous tissue with underlying bone formation potentially through enchondral ossification [Figure 3]. Follow-up at 18 th month post-operatively showed no signs of recurrence and patient reported the associated pain to have completely subsided. Our case demonstrates an unusually rare location of a common tumor, osteochondroma in an adolescent Indian child. While majority (85%) of osteochondromas present as solitary and nonhereditary lesions, a small cohort of these affected patients can demonstrate multiple lesions in the context of hereditary multiple osteochondromas (HMOs), a disorder that is inherited in an autosomal dominant manner  . In our index case, fortunately, latter was not observed, and the lesion was isolated. Interestingly the presence of the isolated mass in the diaphysis was intriguing. With no clearly defined etiology, it is postulated that a peripheral portion of the physics herniates from the growth plate and gives rise to such outgrowths as seen in osteochondromas  . This herniation could either be idiopathic or following trauma or due to a deficient perichondrial ring. This leads to abnormal migration of the metaplastic cartilage that responds to factors stimulating the growth plate and subsequently results in what is seen as an exostosis outgrowth. This possibly explains the medullary continuity of these lesions with the shaft of the bone. The physis herniation theory also explains the growth potential of osteochondromas until skeletal maturity  . Histopathological examination shows the outer layer of the head of osteochondroma to be composed of benign hyaline cartilage, while the perichrondrium continuous with the periosteum of the underlying bone surrounds it peripherally. The cartilage appears as disorganized growth plate undergoing enchondral ossification in contrast to the newly formed bone that constitutes the inner portion of the head and stalk of the tumor  . Most common location for Osteochondromas are around the knee, especially in the metaphyseal region of either the distal femur or the proximal tibia  . In our case, a solitary exostosis in the diaphyseal region of the femur has been observed and to a review of current literature revealed only one case by Rijal et. al. documenting this rare location prior to our report  . Since these tumors may occasionally be asymptomatic, the diagnosis of these tumors is often times an incidental finding on radiographs that are obtained for other reasons. Pain associated with osteochondromas is usually due to irritation of the surrounding musculature and neural tissue; bursitis over the exostosis or due to fracture of the stalk ,, . Occasionally, these lesions can predispose to restricted joint movements, neural or vascular compression, and deformity and shortening of the long bones ,, . In addition to the detail history and meticulous examination, radiological techniques are a key to its diagnosis. A plain radiograph depicts an osteochondroma as a stalk or a flat protuberance emerging from the bony surface. For demonstrating osteochondromas of the spinal column, shoulder and the pelvis, computed tomographic scans play a pivotal role in diagnosis. MRI serves to be the most precise imaging technique for symptomatic bone masses as it can potentially depict the exact morphology of a tumor, arterial and venous compromise and nervous lesions, as well delineates the continuity of the exostosis mass to underlying cortex of bone, and lastly help visualize the water-rich cartilage cap and its thickness. Even though osteochondroma are classified as benign tumors, nevertheless, they are the most common precursor lesion for its malignant counterpart, secondary chondrosarcoma. Malignant transformation of a solitary osteochondroma may occur in 7.6% of patients while stakes could be higher to approximately 36.3% in patients with HMO's syndrome  . Enlargement of tumor and irregularity of margins on plain radiograph  ; increased thickness of cartilaginous cap  ; accompanying edema in a short time inversion recovery  and increased metabolic activity on thallium scan  are the alarming signs of malignant transformation. While no treatment is necessitated for asymptomatic lesions, clinicoradiological monitoring is utmost necessary with each subsequent follow-up. Surgery is indicated in the patients with a large tumor with persistent pain or pain during activity in skeletally matured patient; neurovascular compression; fracture; cosmesis and malignant transformation. Complete surgical resection should be performed. Any remnants of cartilage from the cap or any perichondrium post-operatively may contribute to recurrence of the lesions in approximately 2-5% cases  . Since a young age owing to h immature skeleton is implicated as a risk for recurrence, it is advisable that the surgical resection be delayed until skeletal maturity is attained. Fortunately, precise gross total resection was achieved in our patient as evident from post-operative imaging and follow-ups. Surgical intervention was planned in consideration of persistent pain and tumoral location away from the epiphyseal plate. Extreme caution ought to be practiced by the operating surgeon in excising these lesions in view of their proximity to the epiphyseal plate in a young patient with immature skeleton to mitigate any injury that might result in growth plate arrest and subsequent deformity. Contrary to the most common location of osteochondroma in the metaphyseal regions of the tubular bones, this case serves best to highlight the unusually rare location of a solitary osteochondroma in the diaphyseal region of a long bone. Orthopedic surgeons and primary care physicians should consider osteochondromas as a possible differential before ruling out the tumoral pathology of the diaphysis of the long bones in spite of its rare occurrence in this region. One or more statements should specify (1) contributions that need acknowledging but do not justify authorship, such as general support by a departmental chair; (2) acknowledgments of technical help; and (3) acknowledgments of financial and material support, which should specify the nature of the support. This should be included in the title page of the manuscript and not in the main article file. SK was involved in patient care and management. KS and SK did the literature search and were involved in drafting the manuscript. SK provided critical appraisals. Both authors confirm that they have read and approved the final version of the manuscript. Murphey MD, Choi JJ, Kransdorf MJ, Flemming DJ, Gannon FH. Imaging of osteochondroma: variants and complications with radiologic-pathologic correlation. Radiographics 2000;20(5):1407-34. Kitsoulis P, Galani V, Stefanaki K, et. al. Osteochondromas: review of the clinical, radiological and pathological features. In Vivo 2008;229(5):633-46. D'Ambrosia R, Ferguson AB Jr. The formation of osteochondroma by epiphyseal cartilage transplantation. Clin Orthop Relat Res 1968;61:103-15. Nogier A, De Pinieux G, Hottya G, Anract P. Case reports: enlargement of a calcaneal osteochondroma after skeletal maturity. Clin Orthop Relat Res 2006;447:260-6. Galasso O, Mariconda M, Milano C. An enlarging distal tibia osteochondroma in the adult patient. J Am Podiatr Med Assoc 2009;99(2):157-61. Rijal L, Nepal P, Baral S, et. al. Solitary diaphyseal exostosis of femur, how common is it? Eur J Orthop Surg Traumatol 2011;21:363-5. Coenen L, Biltjes I. 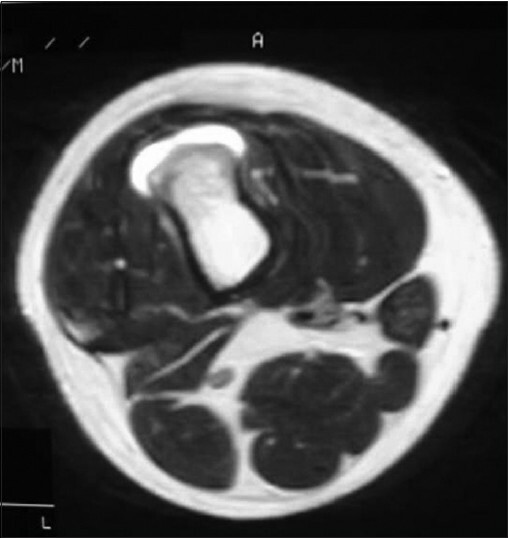 High radial nerve palsy caused by a humeral exostosis: a case report. J Hand Surg Am 1992;17(4):668-9. El-Khoury GY, Bassett GS. Symptomatic bursa formation with osteochondromas. AJR Am J Roentgenol 1979;133(5):895-8. 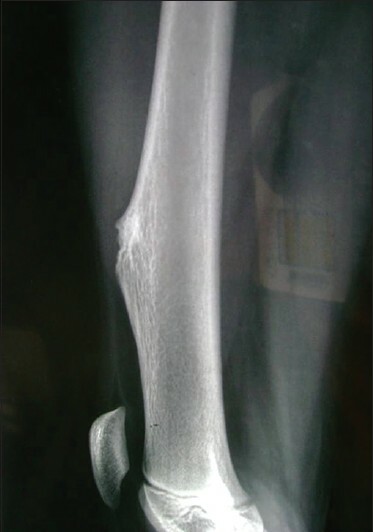 Robbins MM, Kuo S, Epstein R. Non-traumatic fracture of an osteochondroma mimicking malignant degeneration in an adult with hereditary multiple exostoses. Radiol Case Rep 2008;3:99. Bock GW, Reed MH. Forearm deformities in multiple cartilaginous exostoses. Skeletal Radiol 1991;20(7):483-6. Ohtori S, Yamagata M, Hanaoka E, et. al. Osteochondroma in the lumbar spinal canal causing sciatic pain: report of two cases. J Orthop Sci 2003;8(1):112-5. Sakamoto A, Tanaka K, Matsuda S, Harimaya K, Iwamoto Y. Vascular compression caused by solitary osteochondroma: useful diagnostic methods of magnetic resonance angiography and Doppler ultrasonography. J Orthop Sci 2002;7:439-43. Ahmed AR, Tan TS, Unni KK, et. al. Secondary chondrosarcoma in osteochondroma: report of 107 patients. Clin Orthop Relat Res 2003;(411):193-206. Park YK, Yang MH, Ryu KN, Chung DW. Dedifferentiated chondrosarcoma arising in an osteochondroma. Skeletal Radiol 1995;24(8):617-9. Garrison RC, Unni KK, McLeod RA, Pritchard DJ, Dahlin DC. Chondrosarcoma arising in osteochondroma. Cancer 1982;49(9):1890-7. Beltran J, Rosenberg ZS. Diagnosis of compressive and entrapment neuropathies of the upper extremity: value of MR imaging. AJR Am J Roentgenol 1994;163(3):525-31. Hudson TM, Chew FS, Manaster BJ. Scintigraphy of benign exostoses and exostotic chondrosarcomas. AJR Am J Roentgenol 1983;140(3):581-6. Day FN, Ruggieri C, Britton C. Recurrent osteochondroma. J Foot Ankle Surg 1998;37(2):162-4.